Hydro Jetting | Brooks Plumbing Co. Leaks and clogs in your plumbing system can wreak havoc on your home and property. Of course, many issues can go unnoticed simply because the majority of your plumbing system is tucked away behind walls and underneath floors. This is why it is especially important that you receive Olympia plumbing services regularly to avoid the costs and damages associated with major plumbing issues. The best way to keep your plumbing out of harm’s way is to tackle problems head-on, both by reducing the risks of them forming and scheduling prompt repairs when they occur. There is one method that plumbers utilize that does both: hydro-jetting. This method of drain cleaning is used both proactively and reactively, making it a worthwhile investment for homeowners all across Washington. Keep reading to learn more. The Only Drain Cleaning That Matters Is the Professional Kind! 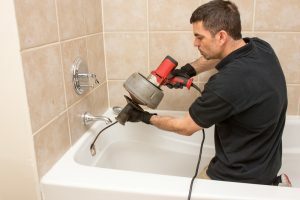 Drain clogs are one of those Yelm, WA plumbing problems that practically all homeowners have to deal with at some point. But clogs are also one of those things that many people deal with the wrong way. When a drain clog forms in the average home, homeowners are, more often than not, tempted to reach for some type of store-bought drain cleaning solution to manage the problem. Unfortunately, this is not a great way to deal with it—in fact it can do more harm than good. Keep reading to learn why you should only trust a pro for this type of plumbing issue. Posted in Drain and Sewer | Comments Off on The Only Drain Cleaning That Matters Is the Professional Kind! © 2011–2019 Brooks Plumbing Co. All rights reserved.